or create your own flavor profile. Each cake is unique and we recommend setting up a tasting/consultation appointment so that you can sample some popular flavors. We can then walk through any design preferences and discuss pricing options. What about the groom? 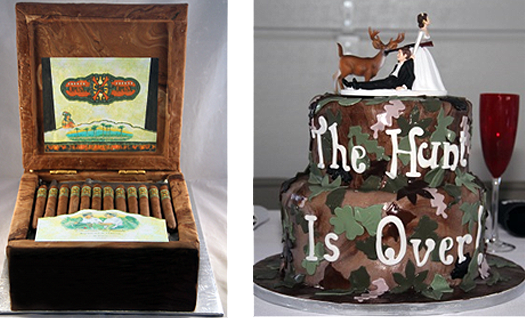 While all the preparation seems to be on the wedding cake, don't forget about the groom's cake. It's not mandatory, but many couples want to include one. It can be served at the reception as the second cake, or served the night before at the rehearsal dinner. Typically the cakes are more outlandish and represent the groom's interest, whether it's a hobby or favorite sports team. Contact Us today to get the process started..
Also, ask about shower and anniversary cakes. 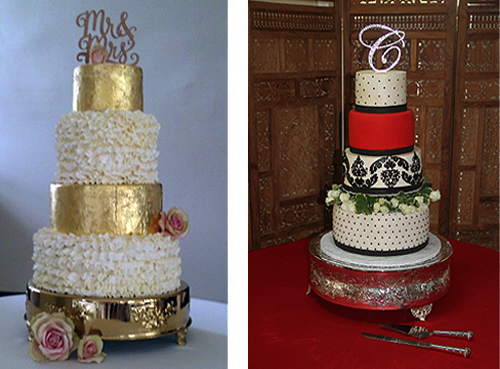 Many couples prefer to have their wedding cake be more modern--something that makes a unique statement about their personalities. 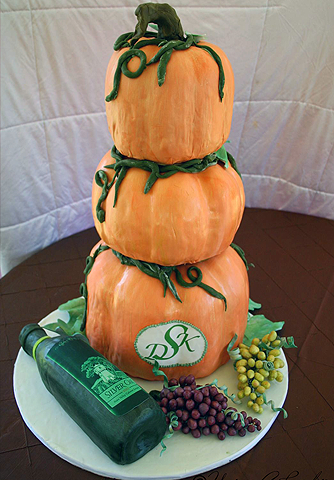 In this case, the groom used to always call his bride pumpkin so they decided to capture that idea in their wedding cake. Each tier is an individually carved pumpkin. Also, each tier is a different flavor (which is an option I offer my clients at no extra charge) and it is covered in fondant over a layer of buttercream. At the base is a wine bottle carved out of cake with their favorite label printed on edible paper and attached to the bottle. The bottom pumpkin has their monogram and you see two bunches of sugar grapes on a vine.